Your knee plays a vital part in your ability to be mobile and walk. The four ligaments of the knee help support it as well as keep it stable by allowing it to move from side to side and in the right direction. As a hinge joint, it depends on surrounding muscles and its ligaments to properly function. The two medial and lateral collateral ligaments work together to allow your knee to move correctly, while the anterior and posterior cruciate ligaments restrict it from moving in the wrong direction. The quadriceps muscles work with your hamstrings and ligaments to stabilize your knees and allow them to work the way they are supposed to. A ligament is made of flexible, yet tough fibrous tissue that can hold together a joint, as well as connect two cartilages or bones. The four ligaments joint work together to support and stabilize it as it moves about. The main ligament is called the lateral collateral ligament. Situated on the outer part of the knee, it is located between the fibula and femur. Its function is to prevent damage to the joint if adverse forces hit the inner part of the knee. It also restricts the range of side-to-side motion to stabilize it. The other ligament on the outer part of the joint is the medical collateral ligament. It can also be found between the fibula and femur. However, it protects the outer side of the knee from negative forces or blows. Same as the lateral collateral ligament, its job is to stabilize the joint. Located on the inner section of the knee joint, the posterior cruciate ligament protects the knee by restricting movement in the wrong direction. It can be found between the fibula and femur, running diagonally between the two. Its primary purpose is to stabilize the joint and regulate backward and forward movements. The anterior cruciate ligament can also be found between the fibula and femur. It crosses the posterior cruciate ligament so the two are sometimes referred to as the cross ligaments. Like its partner, it stabilizes the joint by preventing it from moving in the wrong direction. 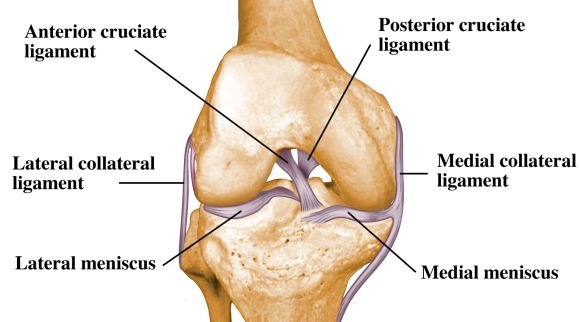 Strong are the four ligaments of the knee, but they still can sustain injury. Sometimes they are sprained by being over stretched or even torn and ruptured. A tear in a ligament can be complete, which means is entirely torn through or it can be partial and only some of the ligament fibers have been torn. However, most injuries to the knee are sprains that heal quickly. The lateral collateral ligament does not get injured very often because it is protected by the opposite leg. However, it too can get hurt when you don’t stretch before strenuous exercise or sports. When it does get injured, it is typically when the opposite leg is stretched out and is not there to protect it. This can often happen in contact sports like football or soccer. The medial collateral ligament can sustain injury from most sports and to anyone of any age. It is most often injured in sports like football or soccer where legs are often outstretched. If the knee joint happens to get hit at the same time leg is out, an injury may occur. The posterior cruciate ligament is a strong, wide ligament which can be injured if you hit your knee or fall on it. This can happen when playing a sport like football or if you are involved in a car accident. However, it is not injured as often as the other knee ligaments. When the posterior cruciate ligament does sustain injury, you may not know it right away. When you do, it is usually because your knee becomes unstable and you wobble on uneven surfaces or while climbing stairs. An anterior cruciate ligament happens when you twist the knee joint in the wrong direction. Women tend to suffer from this injury more than men and when this ligament is injured, they often hurt another ligament at the same time. Individuals are most likely to injure it while engaged in sports such as skiing, tennis, football and basketball because of the pivoting required of the knee. Cannot bear weight on site of injury without pain. Without treatment, knee ligaments injuries can flair up even years after the initial injury. When they do, you may experience pain or your knee may be weak. If you experience any of these symptoms, see your doctor so he can evaluate your symptoms. You may need imaging tests like MRI, scans or x-rays. In the case your knee and ligaments are swollen, a needle may be used by your doctor to drain it. 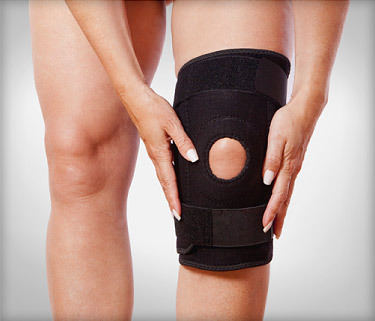 If a knee ligament is entirely torn, complete recovery may not be possible. Surgery for ligament repair may be needed if the nonsurgical treatment options do not work. Since people heal at a different speed, a therapist should evaluate your injury along with your doctor. The severity of the injury to ligaments of the knee will partially determine your recovery time. You may need to change to low-impact exercise or sporting activities to help an injury heal. Sometimes you cannot resume a sport for as long as six month or longer. The knee or ligament inflammation is gone. No pain present when you jog, run or jump. No pain present when you bend at the knee. Your injured knee feels as good as your good knee.